Legacy of Discord ‘s Super Sale! Legacy of Discord is introducing a brand new rewards event to our players! 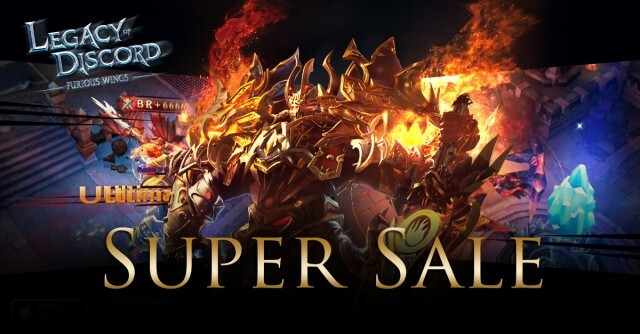 From Feb 9 to Feb 11, the new Super Sale event will be online. Get a bundle of resources at a huge discount. Lavissa pack, immortal pack, panthora pack with a huge discount! During the event, limited items will be sold at a great discount each day. Spend diamonds during the event will exchange to points. Points can exchange items in the shop. Stage rewards will be obtainable when points reach certain stages. Unused points will be exchange to Gold when event finished! GTarcade is a leading global developer and publisher of free online games. With its guiding principle to “create leading global entertainment brands”, GTarcade has created award-winning MMORPG and strategy games for browser and mobile.